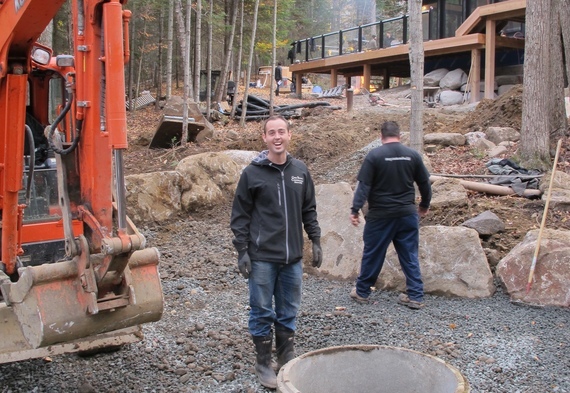 As work progressed -- and as our overgrown landscape was cleared -- we excavated an almost never-ending supply of boulders and rocks, many of which would have cost hundred of bucks a pop had we flexed our wallets in the local aggregate yard. Colin and Justin's Landscaping: You gotta dig deep if you wanna find buried treasure. 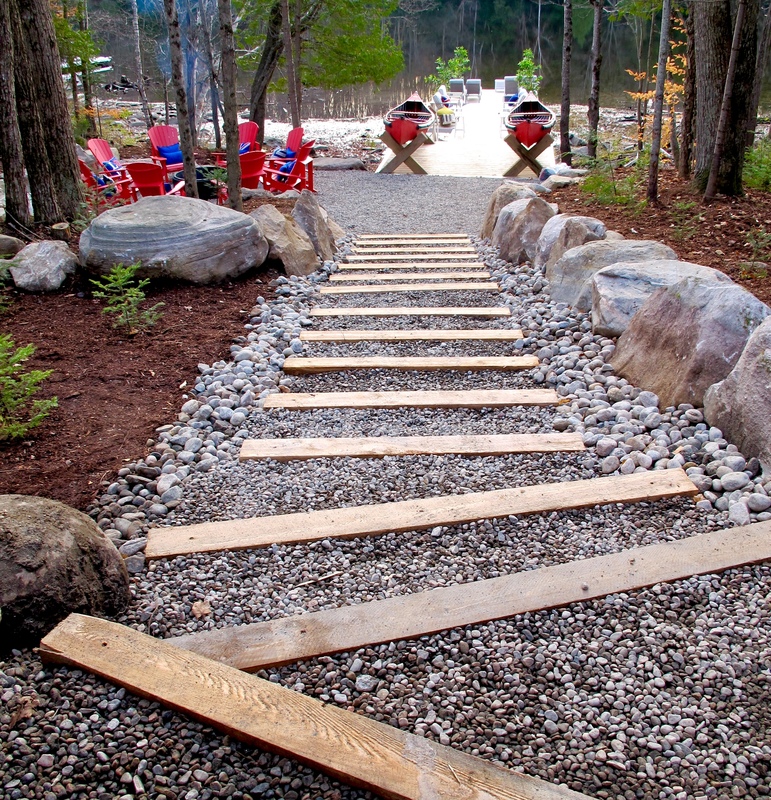 Yup, that's what we did whilst landscaping our lakeside property to prep' for our "lift," showcased in these virtual pages some two weeks past. 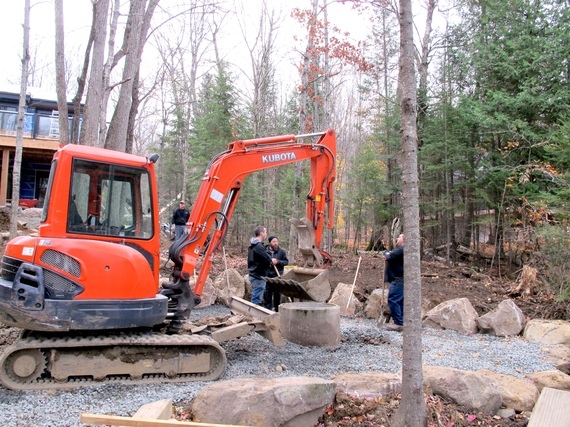 As work progressed -- and as our overgrown landscape was cleared -- we excavated an almost never-ending supply of boulders and rocks, many of which would have cost hundred of bucks a pop had we flexed our wallets in the local aggregate yard. The even better news about reusing our rocky bounty? No removal costs and instant "provenance": the landscape detailing, after all, actually "belongs" -- and indeed has always been -- on site. Albeit hidden from view by the passage of time, fallen trees and the associated organic debris that builds up over centuries. During last season's Cabin Pressure we worked with Greg Brown Construction and they made a stellar job of re crafting the space that surrounds Grey Gardens. This year our brief was similar: our cottage landscape should 'whisper' rather than 'scream' as viewed from the road or indeed the lake. In the first instance, the team at GBC suggested we contact Arbor View, a certified firm of tree surgeons and arborists with whom they often work. Arriving on site, the sympathetic team at Arbor View suggested it would be far 'seemlier' to gently limb the branches of some of the larger trees (they called this a 'vista prune') rather than over fell healthy tree stock. We were certainly on board for this process. And at the same time they'd clear the dense undergrowth and shrubbery that was effectively obscuring all sightlines to the twinkling waters of Drag Lake. With a system of pulleys and ropes interwoven through the tree stock, the Arbor View boys sawed and clipped until sightlines were radically improved. We learned that this trimming and pruning process can actually be good for remaining tree stock which can better 'breath' as a consequence of freeing up soil and light space. Sure, we lost a few skinny trees in the process, but the arborists made what can best be described as a thoroughly sensitive job. With the landscape pruned, the Browns set to work. 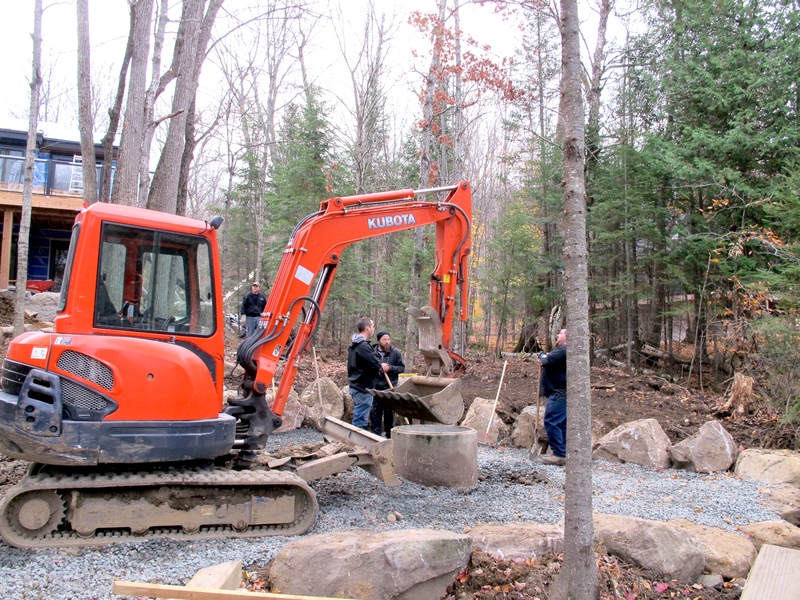 Using an armory of landscaping machinery and large diggers they prepared the terrain and cleared a pathway between the cottage and our new dock. This done, a perimeter either side of this pathway was formed (using our boulder bounty) into which were bedded hemlock beams, chopped to size, to form chunky steps. Tune in to see all the action unravel during the groundbreaking episode! The team also created a wonderful fire pit zone using a section of redundant concrete drain which we'd found, discarded, below water level near our shoreline. Bedded into the ground, and circled with a gravel border, it's the perfect place for a cluster of outdoor foldable chairs. 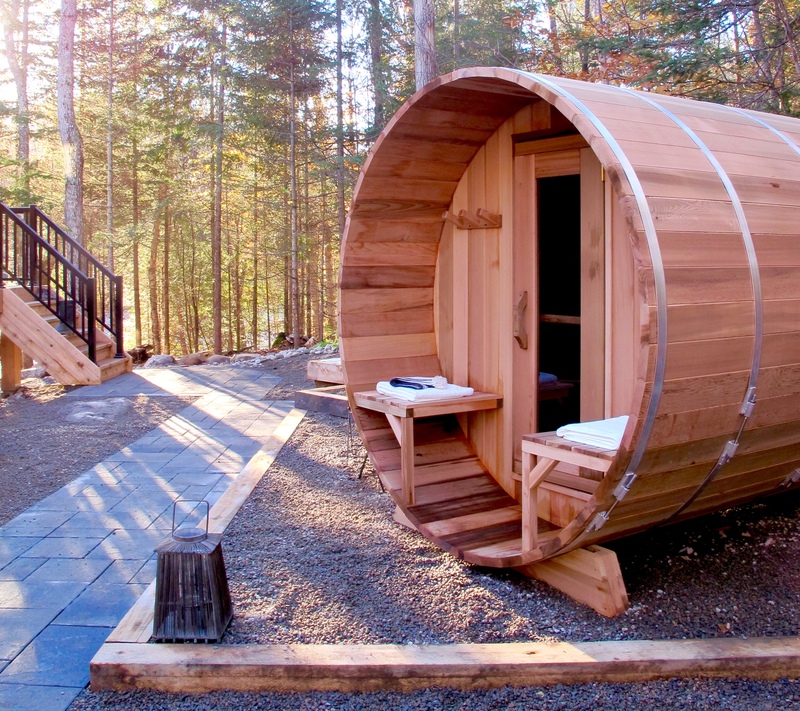 Throughout Cabin Pressure we've remained keen to shop Canadian wherever possible and with West Guilford's Cottage Country Log Cabin just a short drive away we didn't need to search far for the eye-popping seats. One hundred per cent weather proof, and produced by CRP Plastic Products, we toyed with various colour combos (they come in a multitude of jaunty tones) before settling on this snappy red hue, a warm allusion to the Canadian flag. There's something just so 'right' about red chairs at the cottage -- they seem perfectly at one with the landscape and they're a lovely nod to the country that's become our second home. Higher up on our property we elected to indulge the project with an outdoor spa. In precisely the spot where it's now positioned once stood a dilapidated woodshed and we figured that, being that the nook remains shaded for most of the day, it made the ideal location. Demarcated around its perimeter with beautiful grey pavers formed into a pathway using Best Way Stone product, the spa corner makes a real statement as viewed from any angle. We were delighted with these grey scale pavers, and indeed by the company's complimentary range of slabs installed at several other points around the cabin (and on the floor in our carport) all of which we'll showcase to you in subsequent weeks. The clean-cut "visual order" imbued by the outdoor garden tile is an attractive compliment to the organic nature of the rest of our landscape. Next up, it was time to turn our attentions to 'bells and whistles' and, this in mind, we installed a dreamy bubbling dip pond by Canadian Hot Tubs. Powered and heated by electricity -- and featuring a range of bubbling speeds and jets -- it's a brilliant asset which can be left on all year round. Hey, even in the winter, with thick snow everywhere, it's perfectly serviceable and tempting. 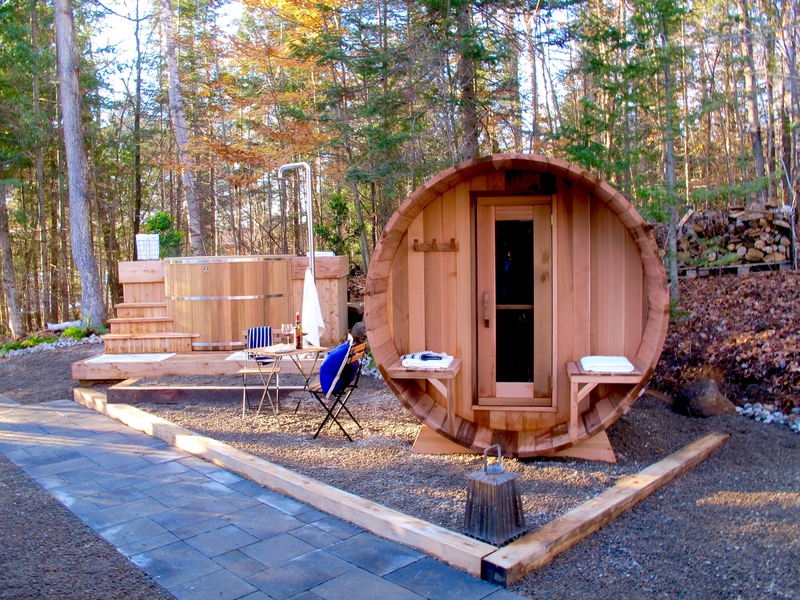 We also added an outdoor shower (perfect for cleaning off after a dip in the lake) and a glorious barrel sauna by Canadian manufacturers Dundalk Leisure Craft To be honest the sauna is an addition with which everyone who visits has fallen in love. 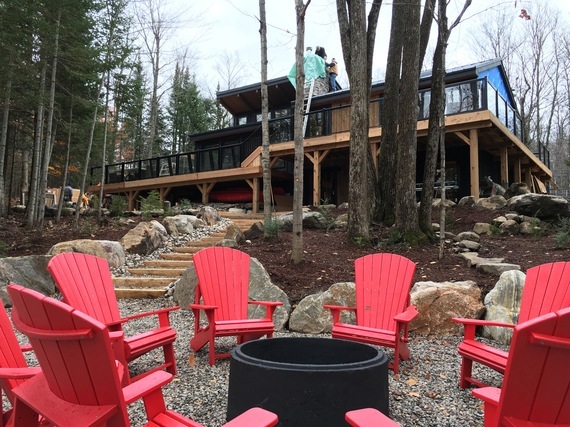 One of our friends, Katie, literally burst into tears when she saw it for the first time as it reminded her of the one built by her late father when she was a child growing up in Muskoka. Several of our outdoors areas -- deck, dock, spa, roof, siding etc -- attended to, it's nearly time to go indoors for the next few weeks of our lakeside series. Next week, on Cabin Pressure, it's all out Colin versus Justin war! Propositioned by our director to work independently (nay, 'secretly') on two very different guest rooms, we came up with entirely distinct visions. One is the very measure of mid century modern, whilst the other is a rustic space with brick veneer walls, chunky rustic shelving, splashes of rusty orange and a low slung wooden bed. But which bedroom will YOU prefer? Option one? Or option two? Tune in to make your choice! Colin and Justin's Cabin Pressure airs on Cottage Life each Sunday at 9 p.m. The network is now in FREE preview.